If singers loved working with Joseph Keilberth [1908-1968], it was because he brought to all his opera performances a deep knowledge of the work in question, a stick technique that left them in no doubt as to his intentions and a highly considerate musical sensitivity. Even in luxuriantly scored works he never lost his ability to ensure a perfect balance between stage and pit. These were ideal conditions for a work like Richard Strauss' 'bourgeois comedy', Intermezzo, for which the composer wrote his own libretto - only the second time that he had done so since the failure of his first opera, Guntram, 30 years earlier. In his depiction of a marital row between Court Kapellmeister Robert Storch and his wife, Strauss did not fight shy of ironic allusions to his own connubial domesticity. The Vienna State Opera mounted a new production of this rarely heard work at the Theater an der Wien in 1963, when Keilberth and the Vienna State Opera Orchestra had at their disposal a team of singers who, thanks to their excellent diction and acting skills, were able to capture the conversational tone that is required but which is so difficult to achieve. Leading the ensemble is Hanny Steffek as the Kapellmeister's wife, Christine. She enjoyed an international career as a Strauss soprano, most notably as Sophie in Der Rosenkavalier, which she sang at Covent Garden under Solti in 1959. Alongside her is Hermann Prey as Storch, a role tailor-made for him both physically and vocally, so much so, indeed, that he was still cutting a fine figure in the part 25 years later in the composer's home city of Munich. 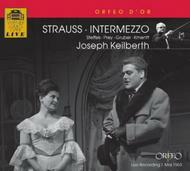 The two tenors in the 1963 Intermezzo, Waldemar Kmentt and Ferry Gruber, had equally long careers, making their mark in roles that serve initially to fuel the petty jealousies between Storch and his wife before ultimately leaving the coast clear for a suitably harmonious ending.